Luckily he's alive, but this has to stop happening. Two horses trotted up to a stoplight on 8th Avenue in Manhattan — a white horse at the front, and a dark brown horse named Billy behind him. They were headed to Central Park to give tourists private horseback rides. But sadly, the horses never made it. As the animals waited in traffic, the engine of a tractor trailer rumbled by them, and a man pulled a vendor cart at their rear. Suddenly, Billy got scared, and he darted backwards and started jolting around in the rush-hour traffic. Billy ended up collapsing into a yellow taxi van, wedging his head in an awkward position beneath the panel of the car. Billy could have gotten seriously injured, according to Carnegie. Billy couldn’t get himself up, and passersby had to help lift him, Carnegie said. 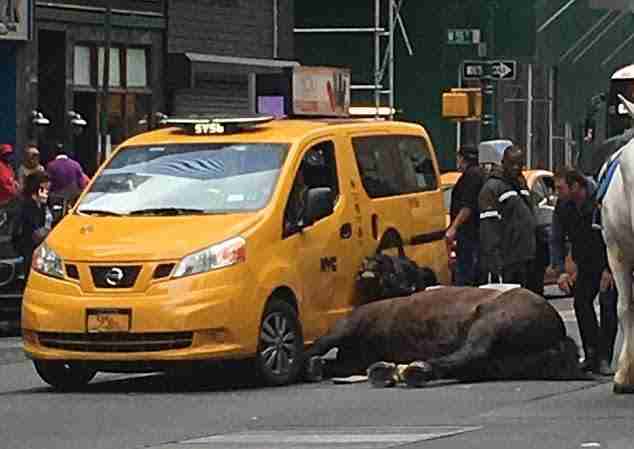 “He was down for several minutes in the middle of 8th Avenue, which indicates that he was hurt quite badly, because any horse would try and right themselves in that kind of environment,” Carnegie said. An industry vet evaluated Billy after the event and gave him a clear bill of health, according to CBS News. Carnegie questions whether the check was thorough enough. 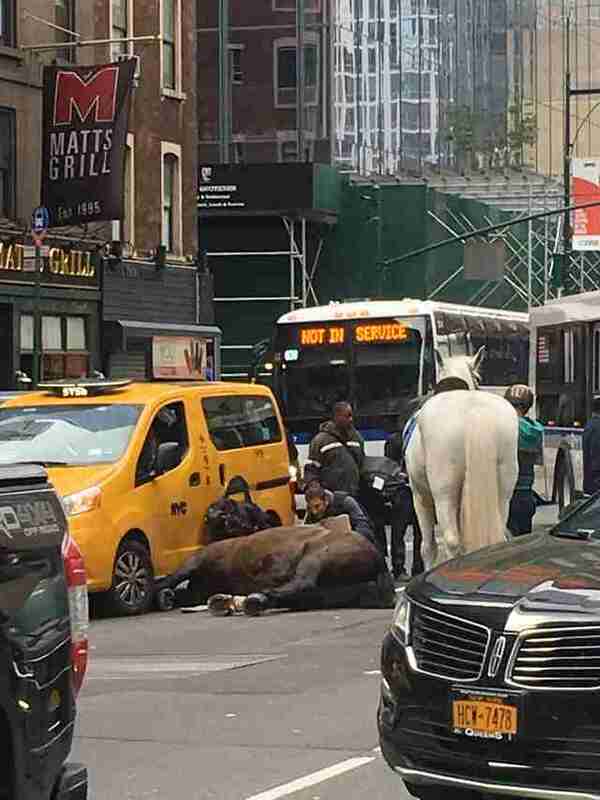 Unfortunately, horses have accidents in New York City far too often. 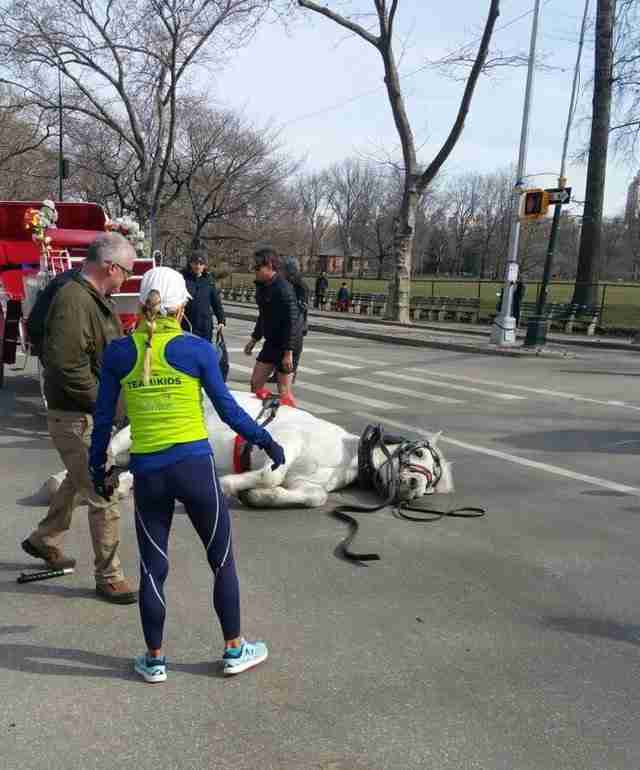 A few months ago, a carriage horse named Max collapsed from exhaustion at the beginning of his shift. The year prior, witnesses watched a driver scream at a 14-year-old draft horse who had also fallen onto the street. And these incidents are just the ones that are documented. Carnegie believes that horses fall in traffic much more frequently than the public knows, but the events slip under the radar. 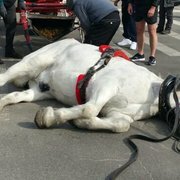 While Billy wasn’t pulling a carriage when the accident happened, Carnegie — and a growing portion of the public — believes that horses shouldn’t be on roads in New York City at all. 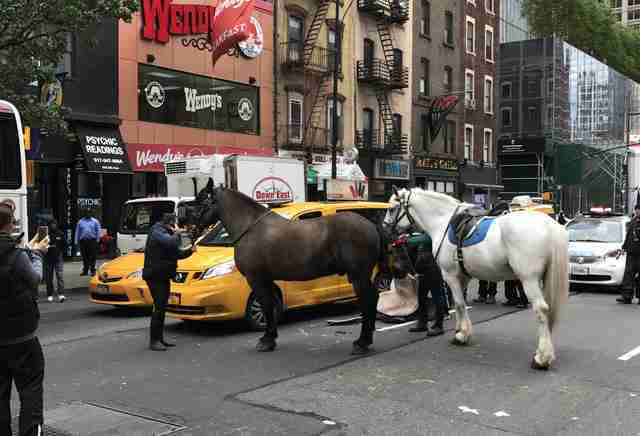 “At NYClass, we firmly stand strong in the logical assertion that horses do not belong in traffic, especially for long distances and especially all day long, as with the carriage horses,” Carnegie said. While it is not clear who owns Billy, Carnegie explained that he lives at Chateau Stables, a company that offers carriage rides and private horseback riding experiences, and rents out ponies for special events. If the company continues to offer horseback rides, Carnegie thinks that the animals should be safely transported in a trailer. Chateau Stables could not immediately be reached for comment. Carnegie also said she suspects Billy might have a similar accident again, especially if he’s so easily spooked by city traffic. She said she hopes that the horse’s owner will allow him to retire. At least one rescue group, Woodstock Sanctuary in New York, has offered to give Billy a new home, where he'd live with another rescue horse, Trident. 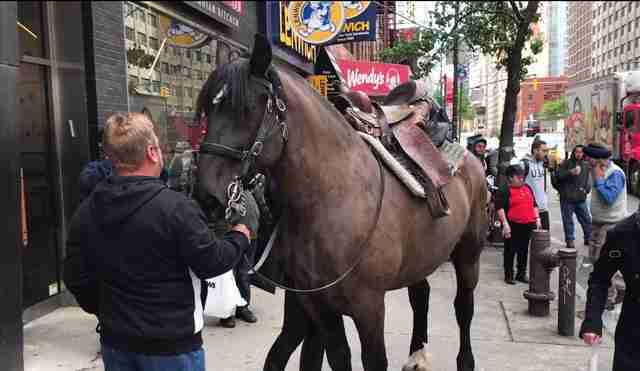 To learn how you can help get horses off the streets of New York City, follow Stopping NYC Horse Abuse on Facebook or sign this petition.